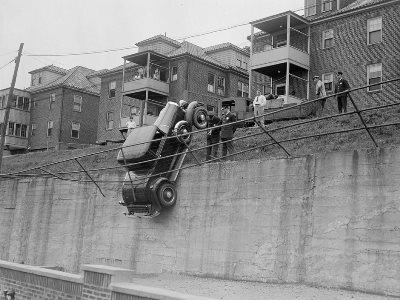 We recently came upon an excellent vintage photo collection of Boston-area car wrecks from the 1930s. Part of a larger Boston Library Collection, the photos were taken by Leslie Jones, a well-known news photographer of the era. Despite the big solid appearance of the cars, the damage is impressive. There weren’t very many safety features built in to these old behemoths. Many of the wrecks look like the vehicles sustained a total loss. Generally, a car is “totaled” when it will cost more to repair the car than the car’s actual cash value (ACV) is worth. Of course, it’s a little more complicated than that, as Gary Wickert explains in Claims Journal: When is A Vehicle Considered a Total Loss? If your car is totaled, you’ll be paid only for the ACV of the car after any deductibles have been satisfied. If you own the car outright, the check will be sent to you. But if your car is financed, the payment will go to the bank or finance company. What if you still owe more on the car than the car is worth? With today’s low down payments and long-term financing arrangements, it can be easy to find yourself under water in a situation where you owe more than a vehicle is worth – in the auto industry this is called being upside-down on a loan – and today, “… it applies to roughly half of all new-car buyers.” Unless you have Guaranteed Replacement Cost coverage or Guaranteed Auto Protection (Gap insurance), you could be out of luck. III says that car dealers often offer a type of gap coverage, but that it might be cheaper to purchase through your regular insurance company. Why not check with your local insurance agent to know your coverage options before buying a new car?